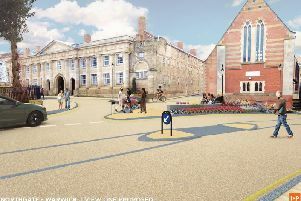 Warwick looks set to lose another bank in High Street. Photo from Google Street View. Another bank looks set to close in Warwick. Last Friday (August 31) bank customers in the town received letters informing them that their Barclays branch would be shutting later this year. A photo of the letter sent to Barclays customers in Warwick. Photo submitted. The letter said that the branch, which is located in High Street, will close on December 14. It says: “The decision to close a branch is never an easy one; however, we are finding that fewer customers are using the branch to do their everyday banking. Kate Gould, a resident in the town, said: “It’s disappointing that yet another high street bank has decided to leave Warwick, and seemingly without any consultation with its customers. Barclays in Warwick looks set to shut later this year. Photo by Google Street View. “For those who cannot do internet banking either because they lack the know how or simply cannot afford a computer, and for those unable to get to Leamington, it is going to cause huge problems. “It also has implications for Warwick as a town centre with yet another business leaving. This will be the third bank to shut in the town. HSBC, which was also in High Street, closed on May 5 2017 and the town’s Natwest branch, which was again in High Street, closed on May 30 2017. When the bank closes the nearest branch will be on the Parade in Leamington.